Listed below are the most commonly asked questions/answers about our studios policies. Note: A minimum number of 6 students per class is required. Your deposit will be refunded if we cannot accommodate you or you will be offered the opportunity to pay for a semi-private class. How do we find the right classes for our child? 1. 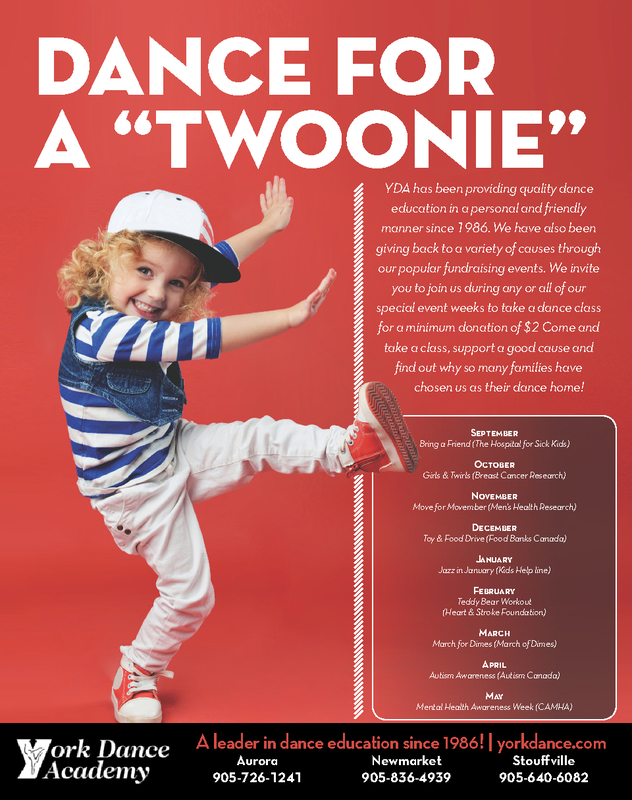 Does your child have any experience or are they new to dance? 2. Has your child participated in other activities which might help them with co-ordination? 3. Is your child looking for a more active or passive dance class? For example, jazz is more of a cardio workout where as ballet focuses more on grace and flexibility. Generally students are placed according to their age and level of ability. For example, a 7 year old with no ballet experience would be better in a class of 6 and 7 year olds rather than a class of 7 to 9 year olds. We may suggest a private lesson for students who are older and at a beginner level. This class will provide them with one-on-one technical instruction before fitting them into an existing group of dancers. Private lessons are booked through the office from $80.00 plus HST per hour. Typically we try to keep the class size ranging from 12 to 15 students. In some cases the class may have more students; however, these classes will have an assistant assigned to help. The minimum number of participants needed to run a class is 6. If we do not receive enough interest to offer the class you have registered for we will contact you with other options. If a suitable substitute class cannot be found you will receive a full refund. All of our teachers are highly qualified professional adult instructors. Many are still performing professionally, have performed in the past or have completed post-secondary programs. You can review biographies on all our teachers here. Can I attend for one term only? We hope that your child will continue dancing all year as it is an excellent form of exercise that develops grace, balance, strength, co-ordination and posture. We also hope to provide your child with an enjoyable experience while teaching respect, discipline, confidence and teamwork. Our year-end recital provides students with a goal to work towards and is an opportunity for him/her to develop confidence, stage presence, and ultimately to share with his/her families and friends what they have learned all year. However, if your child is absolutely not enjoying his/her dance experience, he/she may withdraw at the end of term one. Notice of withdrawal from term two must be directed, in writing, to the General Manager and must be received prior to December 1st, 2017 to avoid an administrative fee of $60.00. What if I drop out before the end of the term? Once a student has been registered for the year, there is no credit for missed classes. Students who withdraw before the end of the term will be charged a $60.00 administrative fee per course and will be refunded for the balance of the classes they will not be attending. If a student misses a class due to illness it can be made up by attending another class in the same or a different discipline that he/she is registered in. Please note that January 31st is the last date to do a make-up class as each class will be working on different choreography. There may be a mini session class that you could attend as a make-up class or you could attend any of our stretch & strengthen classes. Please check with the office staff for class availability. In the event of a severe winter storm, the studio reserves the right to cancel classes for the safety of our students and instructors. Should we choose to cancel classes, a message will be left on the studio’s answering machine and on our website after 2 PM on weekdays and 8 AM on weekends. No refund will be given due to winter storm cancellations; however, if we have to cancel a class for any other reason there will be a make-up date scheduled. This class will be re-scheduled prior to the year-end recital and may be on a day other than your regular class day/time. We will try our best to accommodate all students; however, we will not be able to schedule more than 1 make-up lesson per cancelled class. Dance is exercise that involves choreography and requires your commitment to participate in a class on a regular basis. If you are absent for several classes, not only will your technique fall behind, but you will also miss learning the skills and choreography. If you miss more than 3 classes in a row, we may request that you book a private lesson with your teacher to learn the choreography you have missed. Punctuality is also important, as late arrivals are very disruptive for the instructor and students. The instructor is responsible for your child for the duration of the class. Once the class is finished we cannot supervise or provide extended care for students. It is important that parents arrive at least 5 minutes before the end of the class to pick up their child. If you cannot, we respectfully request that you appoint another parent to watch your child until you can pick them up. For their own safety students are encouraged to wait inside the studio for parents to pick them up. Note: For ECD students we encourage parents to either stay in the studio or appoint another parent to remain in the studio in the event your child needs help to use the washroom during the class. Dancers are to wait quietly in the proper area until they are called into the studio by the instructor. For safety reasons, dancers should not be in the studio without an instructor being present. Parents may watch the class from the viewing areas and should not enter the studio unless they have been invited in by the teacher. Absolutely no outdoor footwear is allowed in the dance studio. Water is allowed in the studios; however, food, other drinks and gum are not permitted. YDA is a peanut/nut free studio so we especially ask that you leave any products that contain or may contain peanuts/nuts at home. We appreciate your consideration in this matter as we have many students with severe food allergies. Dancers are to eat in the designated area at each location. Dance is a discipline and there are certain behaviours that are unacceptable. Students are expected to conduct themselves in a proper and respectful manner while in the studio. Disruptive behaviour may result in disciplinary action up to and including removal from the program. Proper dancer manners are posted around the studios. Please make yourself aware of these. Our faculty and staff are trained professionals and we make every effort to create a safe and positive environment. We reserve the right to use any photos taken during any of our events for promotional purposes. No names will be used at any time. If you do not want us to use a photo of your child, please notify us in writing and we will respect your privacy. How do I stay in the know with YDA? We make every effort to ensure that dancers and their families are aware of all the activities and events planned around the studio. Important dates and class cancellations due to holidays are posted on our website. Newsletters are handed out and/or emailed periodically throughout the year. The newsletters can also be found on the bulletin boards at the studios. You can stay up-to-date by following us on Facebook, Instagram & Twitter. Should your contact information change, we ask that you notify us immediately so we can make the necessary changes. If you cannot find the information you are looking for, you may also contact us at info@yorkdance.com. Dancewear is available at all YDA locations during office hours. We also sell some awesome YDA swag, check out the selection here. There are also many retail dance stores throughout York Region and we would be happy to recommend one for you. Please view this document for dancewear requirements for all your classes: York Dance 2018-2019 Rec Dance Attire. The dance year runs from September to the recital in June. Fees include lessons, the dress rehearsal date and performance supervision as well as the costume for the year-end recital. We offer a discount for any additional family member or additional classes taken by the same student. Please note that we do not accept debit at our Stouffville location. All the details on YDA fees, please refer to this document: York Dance 2018-2019 Fee Schedule. How long is the dance season? When does it start? Our school is a FULL YEAR dance school running from September until the recitals in June. Recreational recital and dress rehearsal dates are between Wednesday June 5th to Thursday June 13th 2019. What holidays does the studio close for? Our students count on being able to attend their dance classes weekly as they value the importance of maintaining their technical and physical level. We therefore close the studio only on certain statutory holidays based on the YRDSB calendar dates. Dates of closures are listed below. Are there opportunities to bring a friend to try a class? Yes! At YDA, we love to give back to the community. Each month we host special event weeks where you can come take a class for only $2 (or by donation) to support that month’s designated cause! Not only is this a great way to try a class with us, but you also support some great initiatives.